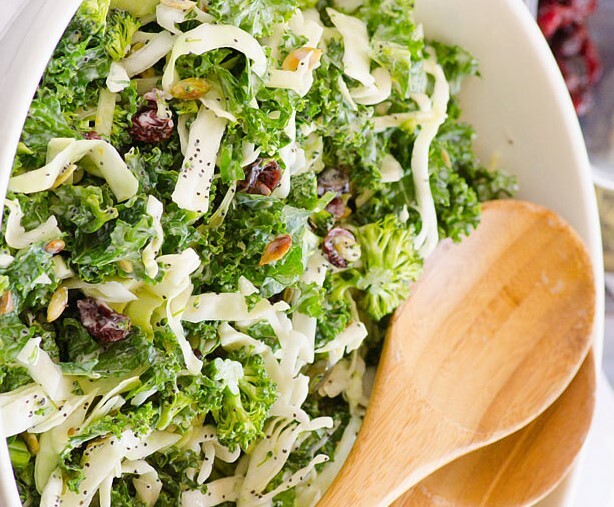 1 Add kale, cabbage, broccoli, brussels sprouts and endive (if using), cranberries to a large salad bowl. Toast pumpkin seeds in a small skillet on low-medium heat until lightly brown, about 2 minutes. Stir frequently and watch closely not to burn. Transfer to a salad bowl. 2 In a small bowl or salad dressing shaker, add Poppyseed Dressing ingredients and whisk or shake to combine. Pour over salad, gently stir and serve.